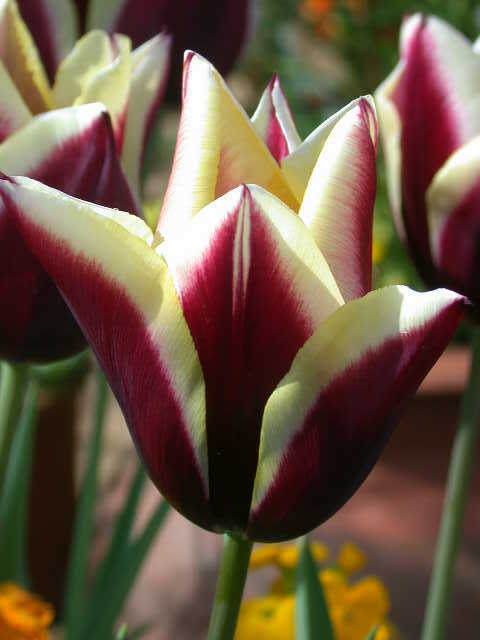 Tulips are among the most popular spring flowering bulbs for use in borders or pots. We have a large range of tulips which we have split into four different types or you can search by name. The short species tulips are perfect for a sunny rock garden and many of them are long lived and need not be lifted or replaced each year. Some of the larger flowered ones like the kaufmaniana (waterlily tulip) or greigii hybrids have large colourful flowers on short stems and are perfect for containers. The lily flowered tulips are very elegant tulips with slender pointed flowers. They come in a wide range of clear colours. We have a large range of tulips for the border, flowering from March through to May. Many of these are also suitable for containers. There are single and double tulips that look like peonies. Click here for an article on growing tulips in pots.